Of all kinds of resources available to company human skills is the most valuable. 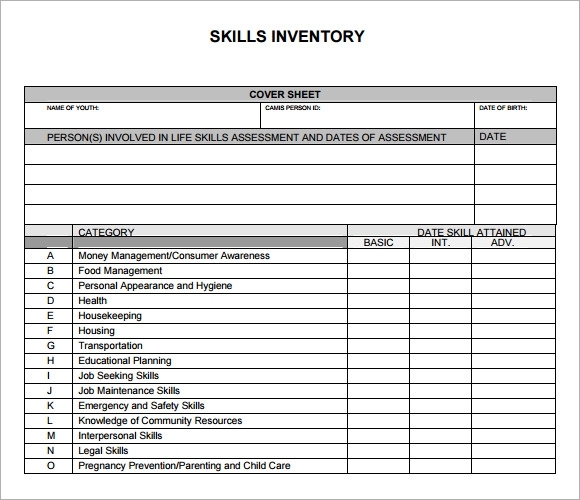 A skill inventory system is a compilation of all the education, experience and abilities of the current employees. 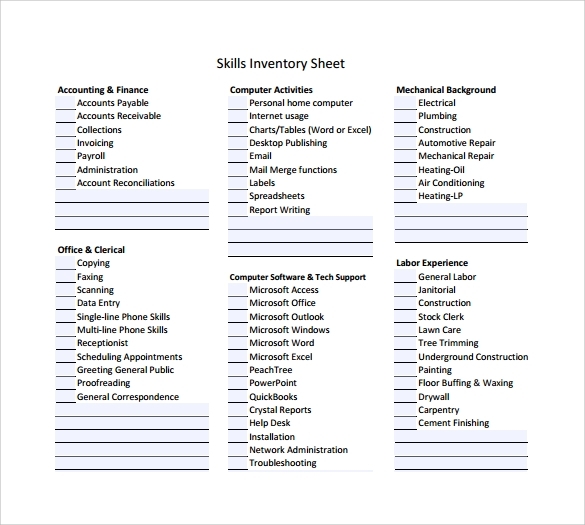 Most organization keeps a detailed skill inventory list to keep a tab on the company goals. 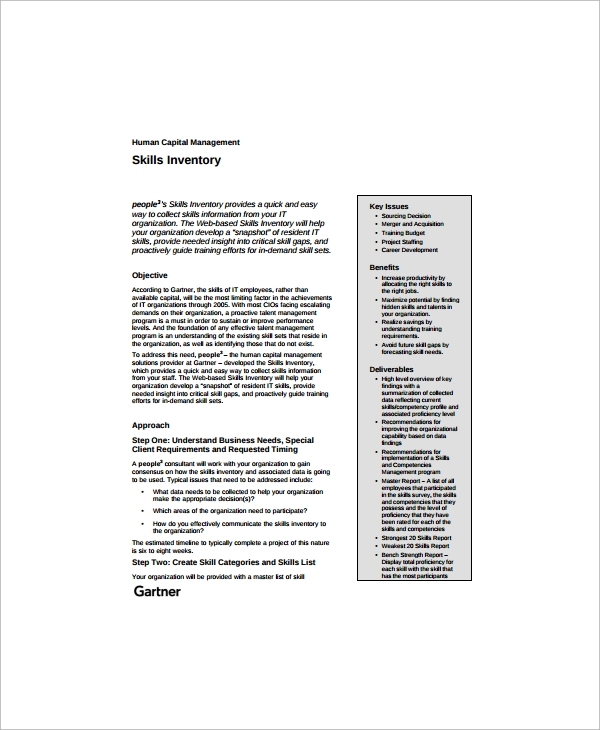 Skill inventory template plays a big role in determining the training and new hiring needs. 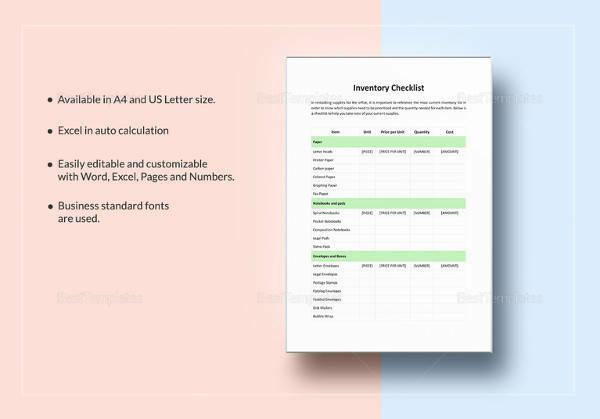 You may like IT Inventory Templates. 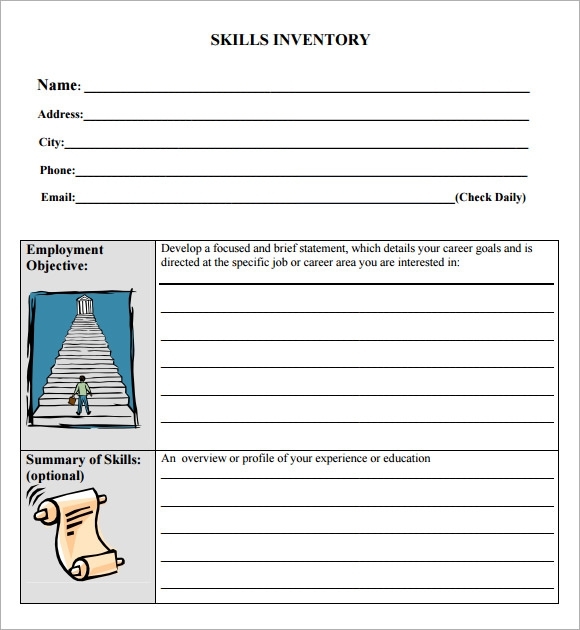 A skill inventory template offers organizations to keep a tab on the employee skill set in a systematic manner. The pool of work force is first divided as per the number of departments present in the company and then various skill sets are rated depending on certain common factors like strategy, strength and importance in the relevant field of work. 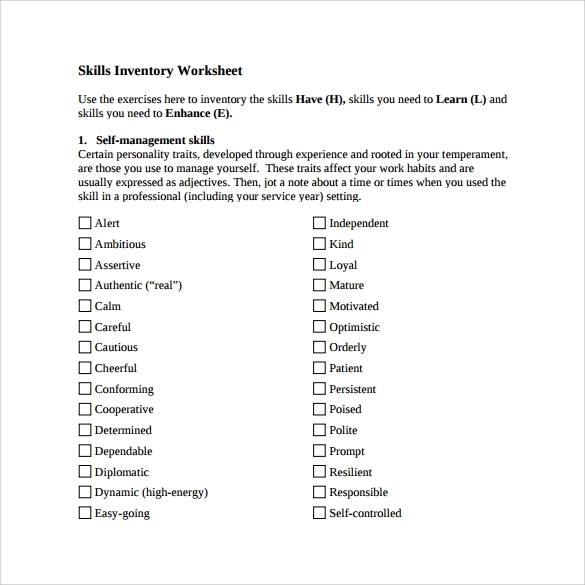 A personal skill inventory template is meant for people for their individual use. 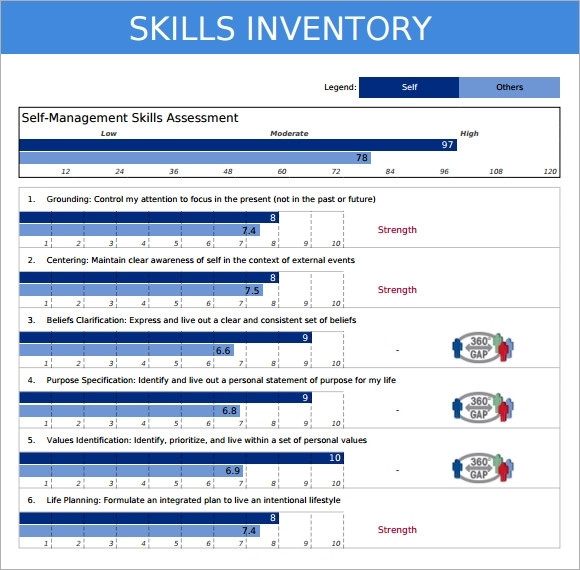 If an individual wants to improve or acquire a new skill set, he can make use of the personal skills inventory template. 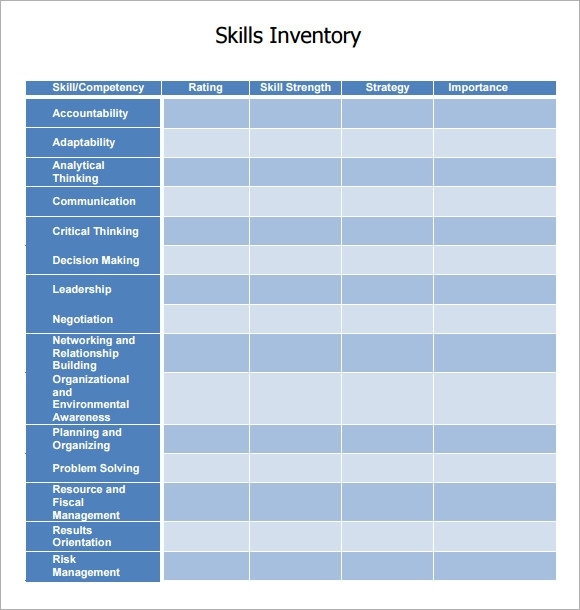 A personal skill inventory template allows a person to identify his core competencies and areas that needs improvement. It is a great tool to review your personal skill set. 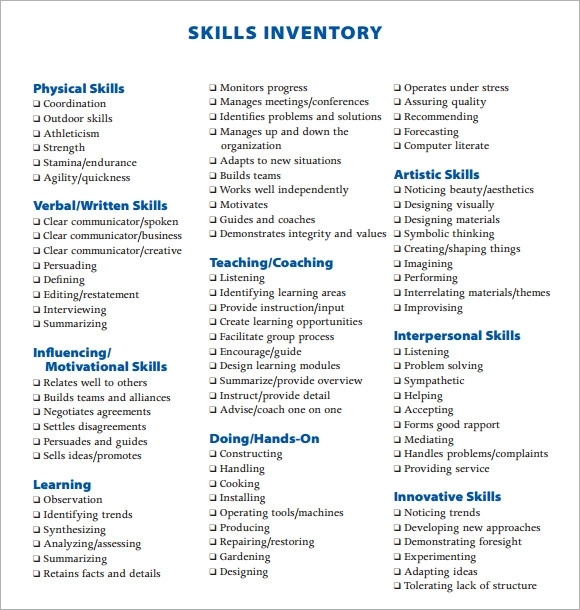 This sample of personal skills inventory lists down an individual employee’s key skills and expertise across various categories. Some of these categories are physical, while others are purely non physical in nature. 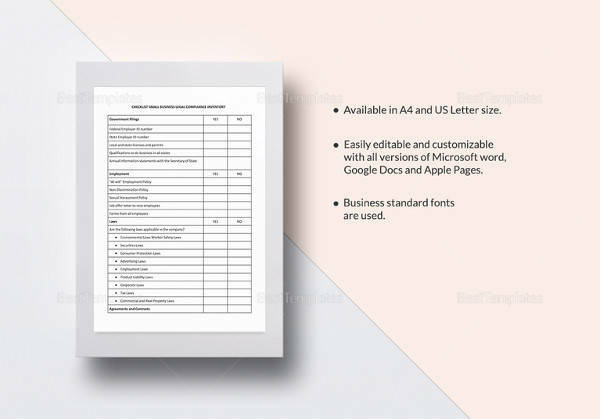 This template is completely customizable and can be edited as per the need of the organization. How can i improve my Personal Skills? There are many ways of improving your personal skills. One method is by enrolling in courses that would help you to excel professionally and the other one is by improving your daily activities like asking new questions, making new friends, observing and hearing more than speaking etc. Lastly keep in mind that developing a particular skill set is not an overnight affair. It takes time, effort and endurance. You may like Equipment Inventory Templates. How is skill inventory used? 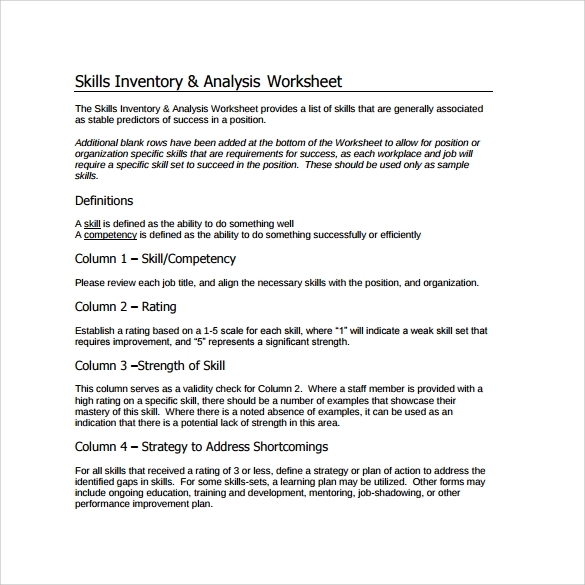 A skill inventory summarizes the skills, education, and experiences of current employees. 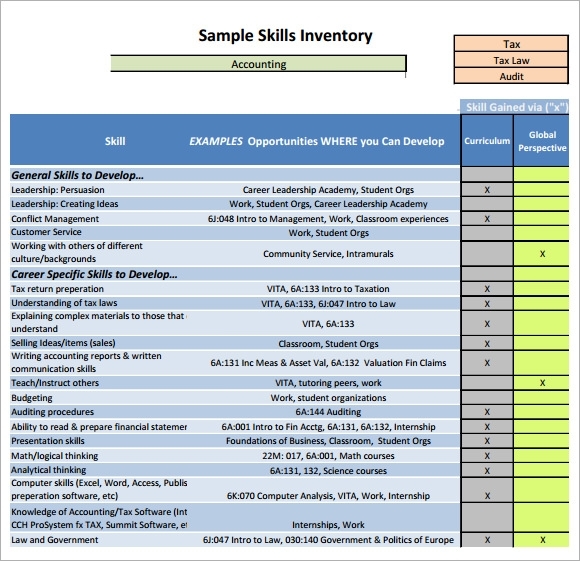 A skill inventory can be prepared using a data based program, commercial software or even simple spread sheet documents or templates. With the help of a skill inventory the management team can identify gaps that exists in between the skill, experience and knowledge that is available with the company vs. the skill and level of experience required by the company. This information can then be used by managers for improved decision making in several areas. You may also see Food Inventory Templates. How can Human Resources Improve within the Organization? The human resource department plays a big role in improving the overall performance of the employee which in turn affects the overall image of the organization. In order to improve the overall performance of employees the HR department should e connected with the business and HR goals should be aligned to and extend from overall company goals. It shall be highly beneficial if the HR department’s focus on administration can be diverted to an area related to data and strategic planning. 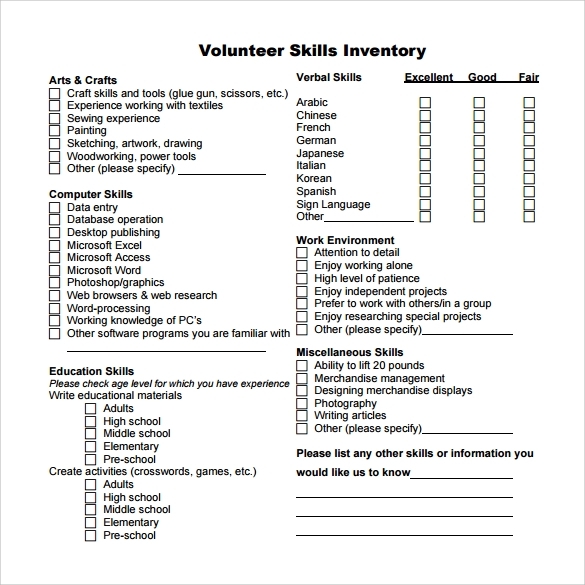 Skill set inventory list is one of the most important and valuable document which every organization should posses. The sample templates offered here are available completely free of cost and can be customized and used across a wide range of fields.